Bucket List: Day 2 | Vespinoy! Day 2 began with the group leaving Legazpi City around 8 in the morning. We were supposed to take off at 6 but the hotel didn’t serve breakfast till then so we decided on the late start. The road to Matnog, Sorsogon is one of the best roads I have ever ridden on. Road condition was excellent for the most part, and where it had damage, the area was painted in a bright yellow box which you could see a good ways away. We had our full of pretty fast paced riding zooming past the different cities and municipalities of Sorsogon. 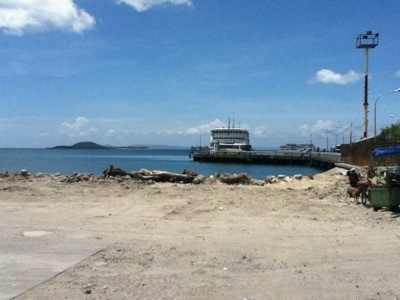 Around an hour before lunchtime we finally arrived at the port of Matnog, Sorsogon. We were leaving the island of Luzon. 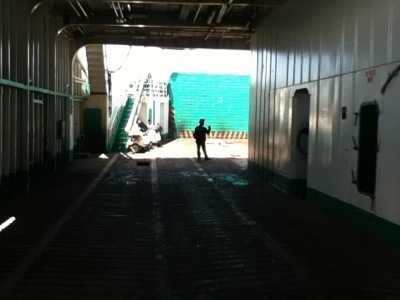 We spent the next few minutes parking our scoots inside the ferry. Checking and double checking that they were secure. As expected, the guys were in high spirits since this would be the first time that some of us were making the crossing. That crossing has to wait, and wait long. The ferry did eventually leave, 3 hours after we had boarded. Still, we didn’t mind. 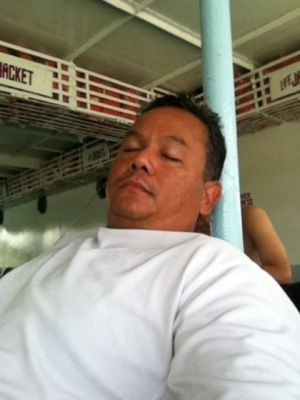 The Visayas was just an hour away. After an hour of uneventful travel, we finally landed on the island of Samar. A quick lunch followed and we were off again. Bernie Lim, one of the intrepid scooter riders who had just come from the North Loop 2, resides in Catbalogan and that’s where we were headed. Road condition was great save for a few areas where bridges were under repair. The pace was pretty quick and we were enjoying the fantastic twisties of the road between Calbayog and Catbalogan when, for the first time on this trip, we had a taste of tropical storm Buchoy. Gusts of wind and a slight drizzle greeted us as we entered Catbalogan just before dark. After checking in in our hotel we dropped Bernie off to reunite him with his family who clearly misses him. It felt good to unwind after a hard day of riding. After another fantastic meal, care of Bernie, we decided to head back to the hotel and prepare for the ride the following day. We were making the jump to Mindanao. But Buchoy would make an unwelcome appearance.